Leddy Maytum Stacy Architects completed the LEED gold certified design of the Commonwealth Club headquarters located in San Francisco, California. Founded in 1903, The Commonwealth Club of California is the nation’s oldest and largest public affairs forum, open to all for the impartial discussion of public issues ranging across politics, culture, the environment and the economy. Over 450 forums are presented annually at the Club and heard across the nation through their weekly radio broadcast, the oldest in the United States, dating back to 1924. The Commonwealth Club’s new headquarters is located at 110 Embarcadero, on the San Francisco waterfront, in an historic two story structure built in 1910 that served as the International Longshoremen’s Association (ILA) Union Hall and was the site of the 1934 labor strike (Bloody Thursday). The historic façade has been preserved, the building has been completely renovated and a new floor added to accommodate the program requirements of the Club. The new headquarters includes two auditoriums, meeting rooms, library, gallery, boardroom, roof terrace, catering facilities, workspace for staff and volunteers, as well as a state-of-the-art audio/broadcast system and high-tech communications platform. 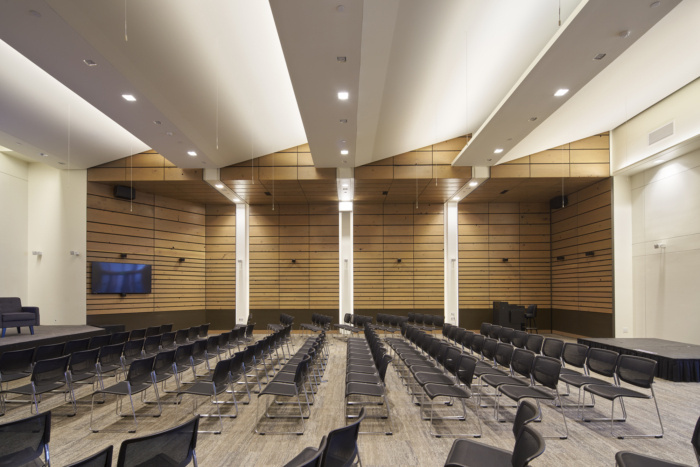 The building is designed and constructed for optimum energy efficiency, targeting USGBC LEED gold certification, to support the Commonwealth Club’s commitment to environmental stewardship. repurposed throughout the building as acoustical wood paneling and casework. program during construction and project commissioning. garden, and building systems results in a 30% reduction in water use.